a’atteh Shonto, Ya’atteh kiis. An unfamiliar face came into view, hand extended in a ready handshake. I had no idea who this was. In the course of a short conversation, I realized he was Harley, the boy who went to boarding school with me decades ago. We swapped stories, two BIA boarding school survivors. We talked of times since, families, health and about why we were both in Shonto. It was wonderful to see an old schoolmate from the 1960s. It was good to know we still share a deep sense of community. We were meeting again at “Rock the Canyon,” the daylong event on September 5 in my home community of Shonto. It was full of celebration, with art booths, music, traditions and everyone full of a sense of pride and honor to be from Shonto, Ariz. “Rock the Canyon” was organized by community members to bring home talents, accomplishments and kinship, and to proclaim to the community’s young people, “We are from here too, much like you.” To say to them, this is your day, this is our day to embrace potential. Our cries and laughter echoed off the canyon above the brilliant green cottonwoods, from the very spot that I first walked into “the American world,” the school world in 1961. This is the place where I began my journey—where I began to peer beyond my horizon and question, yearn. Yes, this is where my journey began. The day was cool with soft female rain blessing us throughout the day, not enough to run for cover, yet enough to be hopeful. Fine artists from the community, Bahe, Anthony, John, brought our visions, truly complementing one another. The day, with its beautiful filtered light, blessed the farmers on their truck beds full of freshly roasted corn, kneel down bread, melons and squash, apricots, carrots. The laughter of elders and a chorus of youth voices just starting to deepen filled the air. The calling of the crows flying high above, yet still below the rim of the canyon, joined varying rhythms of instruments as music rose from the canyon. James, our MC, was at his best, one with the microphone. Laugher erupted with his commentaries. 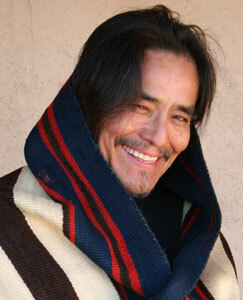 James is a natural Navajo showman, a modern day shaman and coyote, with a microphone for a wand. Sharing talents in words, poetry and music: discothèque, Buddy Whitethorne, the Clansmen, and the Keith siblings punctuated the air. My elders, dressed in their finery, applauded each rock ‘n’ roll song. The stage collapsed very early that day and people scrambled and did what they had to do to stabilize it in time. Their working together was a good example of how things used to be done and still are done during healing gatherings. From where I stood, everything moved smoothly. There were no uncomfortable empty spaces, no equipment malfunctions, no disagreements. I truly believe I witnessed community that survives in spite of our tribal bureaucracy. Later, I took the stage and crooned a love song to my community. Cries for encore ensued. Young people from the community came to my booth, showed me their art, spoke of their talent, sought advice. Their parents and grandparents came by. Ye go, shiye’ bika anilyeed. “Please help my son, please advise my son,” an old school mate asked of me. I have not seen Robert in 30-some years. And he wanted the best for his son, wanted him to be like me. He asked me to say a word to the boy, give his son a line or two to remember. Requests like this from my own community members made me feel respected and honored for what I do best and love most. Shi’aj, ha tiish ba’na’nana diiji? “My son, what is it that keeps you out of my view?” Grace asks me. I say it is this and that, and that and this, that I have to do here and there, now and then, everyday. This is what I do. To her ear, this is what I do. And the question remains, what am I doing anywhere else? Yes, the visions of the Shonto Tourism Commission came together in 16 hours of community celebration. The strength that is reflected in the eyes of my maternal elders, the strong hand shakes of elder men, the promises in youthful faces—there is still much to celebrate. Rock the Canyon.